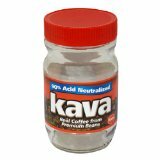 Kava Instant Coffee - Where is it? I have been drinking Kava for about 15 years and now I can't seem to find it in grocery stores in Central Washington state. The coffee always was in big jars, more than a 4 oz jar. Is it no longer available in grocery stores? You can purchase the 4 ounce jar from the links on this page: https://www.ultimate-coffees-info.com/kava-instant-coffee.html. As for the 8 ounce jars, they are still being manufactured. However, it is up to the stores to decide if they will carry it or not. You can try contacting your local store manager and asking them to start stocking it again.